Wondering what to get your Bridesmaids and Maid of Honor for their "thank you for being a part of my big day" gift? With the holiday's around the corner it's a good idea to take advantage of all the sales going on, especially during Black Friday. When thinking about what to get your girls make sure to keep their personalities & interests in mind. You want to get them something that they can use outside of your wedding. Also think about how you can help keep their costs down. We all know your girls are shelling out a lot of money to be a part of your special day and they do this because they love you and want to see the bride with a big smile on her face. A great gift might involve helping them save a little $$. Instead of making them buy their shoes, jewelry or hairpieces think about those as gift options. Here are a couple gift ideas to get your ideas rolling. 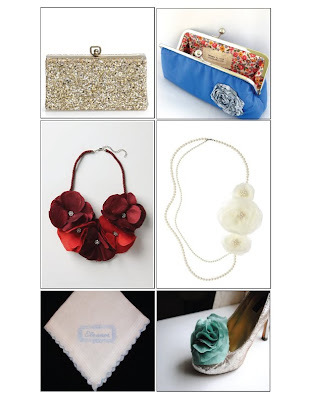 Row 1 - Cute clutches for bridesmaids are getting easier to come by thanks to JCrew and this Etsy designer. Row 2 - These ultra adorable necklaces from Anthropologie are a beautiful addition to any bridesmaid dress, but will also dress up a casual outfit of jeans & a tee for a girls night out. Row 3 - A beautiful hanky for your girls and even your mom and mom-2-be makes a touching gift. Personalize the hanky with their name, a poem or a special saying that only you two know about. This gift will be sure to bring a tear to their eye. These oh-so-cute shoe clips are fabulous. I love how you can dress up any pair of shoes with these cute shoe clips. If you want all your girls to have the same shoe, this is a great way to help them save $$. Just have them all get a solid colored shoe (which every girl has a pair of black heels in their closet) and add a flowered shoe clip for a touch of style & elegance. These are great gift ideas for bridesmaids. Last month, I arranged my brother’s wedding ceremony by booking one of elegant New York wedding venues. Hired a wedding caterer and did an amazing job in preparing excellent recipes for this event.